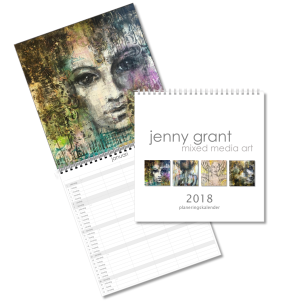 This Art Planner/Family calendar will help you keep track of all your projects or the whole family. With 1 month per spread and 5 columns, one for each project or memeber in the family, you can keep up with your busy lifestyle. I hope this gives you a chance to plan in some time for rest and recovery in your daily life. In calendar there are 12 big vibrant prints of my art. People often find my art very peaceful, even though it is colourful and full of energy. I hope you feel the same.